Around the world geneticists are now continuing one of the biggest scientific projects of all time. Known as the Human Genome Project (HGP), the aim is to decipher the entire genetic code of human beings, and to try to understand the functioning of the 40,000 or so genes that make up the DNA that lies at the heart of every cell in our bodies. This project has been called the biological equivalent of putting a man on the moon. Thousands of researchers in many countries are engaged in this project, and the US government alone has committed three billion dollars to the effort over a fifteen year period. HGP research in the US is coordinated at the National Human Genome Research Institute, located at the National Institutes of Health in Bethesda, Maryland. Knowledge gained by HGP researchers and by other gene scientists is giving us an unprecedented ability to manipulate genes - what is known as genetic engineering. While this technology may lead to new cures for inherited diseases, and even (it is hoped) for many kinds of cancers, some religious believers have been resistant to genetic engineering. Some have even expressed the view that DNA is sacred and that scientists are hubristically attempting to "play god" when they tamper with DNA. But if this view has received considerable media attention, there are also Christians who see genetic engineering as in keeping with their Christian mission. One of this latter group is Dr. Francis Collins, a leading gene researcher and the director of the National Human Genome Research Institute. 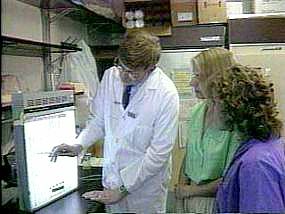 Dr. Collins, who was head of the team that discovered the genes for cystic fibrosis and Huntington's disease, is a devout Christian, having become converted to that faith at the age of 27. Rather than seeing genetic engineering as contrary to his faith, Dr. Collins considers it as an extension of the Christian mandate to help heal the sick. Likewise Lutheran theologian Ted Peters, an expert on the theological implications of gene science, sees no intrinsic problem here from a Christian perspective. In particular, Peters regards the idea of DNA being sacred as muddle headed. Why single out DNA, he asks? It is just another molecule in our bodies, a very complex and important molecule to be sure, but ultimately just another part of our physical makeup. In that sense it is no more sacred than say our blood, which is routinely manipulated by doctors. Consequently, Peters rejects the view that genetic engineering is "playing God". Like Collins, he sees it as a powerful way to alleviate sickness and suffering, and therefore something which, used wisely, should have theological sanction. Yet there is no doubt that some advances in gene science do worry many religious believers - and also many non-believers. One recent development that has caused concern is cloning. The first announcement of a cloned mammal came in 1997, when the Roslin Institute in Scotland made headlines around the world with their cloned sheep named Dolly. Since then, other researchers have cloned cows and mice. When news of Dolly hit the press many people feared cloning would open the door to all sorts of evils. Could a dictator clone a private army? Or perhaps himself? Would a clone be treated as fully human? Would cloning lower the value of human life? After the announcement of Dolly, President Clinton called for a ban on all scientific and medical research into human cloning, and in February 1998 Senator William Frist introduced into the US Senate a bill that would make human cloning illegal. Even some scientists are concerned about human cloning, including Dr. Collins. While supporting research into animal cloning for agricultural purposes, he believes that "this way of creating a human being" is "not part of God's plan for our lives." Both Collins and Peters believe that given the immense power of genetic technology it is vital for people of faith to understand gene science so they can be constructively involved in deciding what we do (or not) with this technology. Like other questions of medical ethics, there is no reason why religion people - not just Christians, but people of all faith traditions, cannot be involved in the ongoing dialog about this science and its applications.